Home » News » Local News » “Cease Fire”? 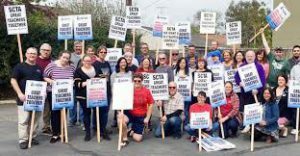 The walkout staged yesterday by two thousand Sacramento City Teachers Association members sparked a response by the Sacramento Unified School District President who sent a system wide email saying they need a “Cease Fire” in the dispute between them, and teachers need to be in the class room. The reaction from both parties however remains the same, the union is charging the district of not following demands in the two-year-old contract by reducing class room size and other support from police and medical staff. The District says they need to meet on the real problem by solving the 35-million-dollar budget gap that may cause the system to be taken over by the state. There are 3 other districts that are under state control, Sacramento would be the fourth. Sacramento Mayor Darrell Steinberg — who helped broker the 2017 contract — and district administrators believe the millions in potential health plan savings should go toward alleviating Sacramento City Unified’s $35 million deficit before improving student services. A new health plan has not been agreed upon. There is also a report that state wide teachers are demonstrating support for the Sacramento City Teachers.